Alan Geoffrey Yates was born in London and educated at schools in Essex. From 1942 to 1946 he served in the Royal Navy as a lieutenant. After the war he worked as a sound recordist at Gaumont-British Films for two years and moved to Australia in 1948. In the same year he became an Australian citizen. Before devoting himself entirely to writing from 1953, Yates was a salesman in Sydney and a public relations staff member at Quatas Empire Airways. His early books were intended only for Australian audience, but when Carter Brown series was picked up by the New American Library, he found readers also in the United States. The Carter Brown Mystery Hour was based on his best selling novels and are introduced by Carter Brown himself. wow this looks like its goong to be fun to listen to , thanks for bringing this to my attention . i am really grateful for the effort you put in maintaining this blog ! 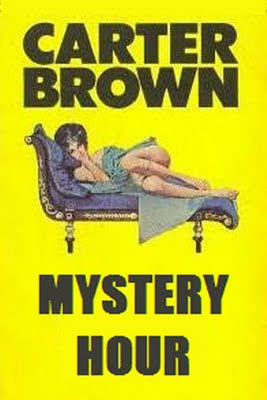 The title isn't Carter Brown Mystery Hour. There were 208 quarter hour episodes, 4 episodes to a story and these were called Carter Brown Mysteries and the title is announced in the introduction to each episode. These were then followed by 26 half hour episodes titled Carter Brown Mystery Theatre. All the stories were based on the Carter Brown books and as a collector of the approx 300 books plus two or three times that of rereleases, U.S. releases, title changes, cover changes etc I have been researching the series for a long time. Whilst these recordings here came from a small section of my Carter Brown transcriptions, it should be noted that the Radio episodes are still copyright and that the licence to play them, from the Author (his wife now he is deceased) has expired. They were only licenced for broadcast for 5 years. So Grace Gibson Productions own the recordings and cannot allow them to be played, the estate of Alan Yates own the copyright but not the recordings. The whole mess will probably not be solved until the next generation of copyright owners where hopefully a deal can be done to allow the recordings to be heard again...legally. Fortunately almost all the episodes survive in Australian collectors hands.